Oxygen Mask with Tubing is designed for patient comfort with a soft, anatomical shape. The strap ends secured to prevent mask separation so you can breathe better. Barbed fittings help prevent patient from disconnecting the mask while elastic straps and adjustable aluminum nose clips secure it for a better fit. Standard with crush resistant safety tubing. Oxygen Mask with Tubing is designed for patient comfort with a soft, anatomical shape. The strap ends secured to prevent mask separation so you can breathe better. Barbed fittings help prevent patient from disconnecting the mask while elastic straps and adjustable aluminum nose clips secure it for a better fit. Standard with crush resistant safety tubing. We specialize in Oxygen Mask with Tubing only, our goal is let all customers get their satisfying products. Customers are welcomed to raise any question, pls feel free to contact us, we will reply within 24 hours. · Oxygen Mask is used for convenient oxygen administration. · Manufactured from soft non toxic medical grade PVC . · Elastic strap and Aluminum nose clip is provided on the Mask for proper adjustment of Mask on nasal area. 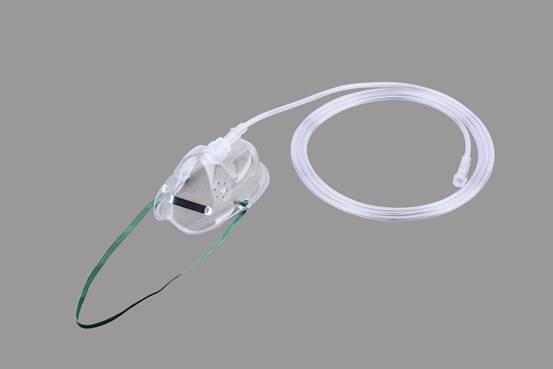 · Multichannel tube ensure good ventilation of oxygen even tube is accidentally folded,twist or pressed. - Non- Sterile/ETO sterilization, individually packed in a polybag/sterilization pouch.